The Cryonomic COB dry ice blasting machine series was originally designed predominantly for use with factory air (7bar). 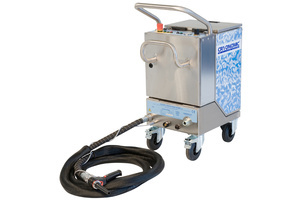 A single hose system for focalised and medium sized cleaning. Combining high performance with low air consumption, together with light and easy manipulation. 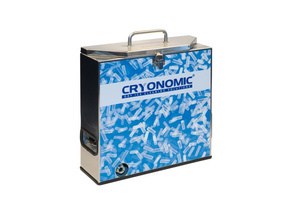 With integrated patented Cryonomic® dry ice cleaning technology. Each dry ice blast machine offers unequalled performance even in the most challenging circumstances. 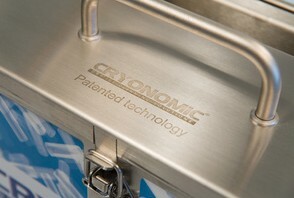 The COB62 is unique in cryonomic dry ice cleaning technology. With the larger COB62 Plus, a measured amount of abrasive can be added into the dry ice stream for more aggressive cleaning. Such as for removing rust, paint and in preparing a surface for re-coating. Via an adaptive, optional module that can either piggy-back on, or standalone of the blast unit. The best product to use with this COB dry ice blasting machine is our 3mm dry ice pellets, to give the very best finished result. Both of these Cryonomic dry ice blast machines have blast pressure regulators, nanometers, and compressed air inlets. They also have options for dry ice or air-only blasting, depending on your requirements. The quick-fit nozzles can be changed within seconds, without the need for any external tools. The handle is also ergonomic, shockproof and thermoplastic for easy and environmentally-friendly blast cleaning. Intuitive control panel with emergency stop and on/off buttons. Robust industrial grade, single touch buttons. Controlling dry ice feed rate and gun light illumination. Blast pressure regulator and manometer. Specially designed ultra-light, easy-to-handle MG1004 gun. 4 heavy duty wheels for easy movement, with 2 braked wheels for stability.